Tobin reads one of McCarthy's poems, "No Country for the Young"
Former Democratic Sen. Eugene McCarthy, one of Minnesota's and the country's most influential political figures of the last century, has died. He was 89. His son Michael says McCarthy died in his sleep at the Washington retirement home where he had lived for the past few years. McCarthy served two terms in the U.S. Senate, and before that five terms in the House of Representatives. His political zenith came in 1968. His opposition to the Vietnam War turned into a crusade to capture the Democratic presidential nomination. McCarthy didn't win. But his candidacy, and the 1968 campaign, left lasting imprints on American politics. St. Paul, Minn. — Eugene McCarthy was Minnesota's senior U.S. senator when he leapt onto the national political stage on Nov. 30, 1967. On that late fall day in Washington, D.C., McCarthy announced his plans to challenge President Lyndon Johnson for the Democratic Party's nomination. Democrats at the time controlled the White House and both houses of Congress. But McCarthy and a handful of other Democrats had grown increasingly skeptical of U.S. policy in Vietnam, and the expanding military operation. That skepticism, he said, was critical to his decision to enter the race. "I don't think it's a qualitative difference. It's just been kind of a quantitative escalation," said McCarthy in his announcement. "And at some point you make a prudential judgment that whatever good you can get out of the war, or what good is going to come from it, is not proportionate to the destruction of life and property and the draining away of moral energy, which goes along with the pursuit of the war in a way in which we are now pursuing it." McCarthy was not alone in his anti-war views, but he was the first Democrat willing to take on this powerful president. In a February 1968 New Hampshire campaign speech, McCarthy described his decision as neither unpatriotic nor un-American. "Those of us who have raised some questions against the administration and have suggested a challenge are variously labeled as dissident Democrats. It's my general thesis that we're not only the most loyal and sound Democrats, but also are carrying out a most significant patriotic duty in the United States in the year 1968," McCarthy said. "There is no question in my mind, and I think in the minds of most historians, that McCarthy played a central role at a critical period in American history, by calling public attention to immorality of the Vietnam War," said journalist Albert Eisele, who wrote a book in 1972 about McCarthy, Hubert Humphrey and the 1968 presidential campaign. Eisele remembered interviewing McCarthy in 1967 about his decision to challenge Johnson. "I think I was the first person to write he was seriously thinking of that, which was hard to believe but was true. And I asked him, 'What makes you think you can take on a sitting president in your own party, someone as powerful as Lyndon Johnson?' And he said, 'This war. When the coffins start coming home to the small towns of Minnesota, people are going to turn against this war.' And he was right," said Eisele. "We're involved, this nation, in what has become a major war. And most of you know what the costs of that war have been, and know that those costs are continuing," McCarthy said in a campaign speech in New Hampshire. "The fact is that there is no economic justification, no economic case for the continuation of the war. There certainly is no diplomatic justification for it. It's not militarily defensible, as we can see in the evidence being presented to us every day. And in my judgment, it has long since passed the point in which it can be morally justified." Fifty-two years earlier, in 1916, McCarthy was born in Watkins, a small rural town in central Minnesota. Growing up there, he developed deep religious roots and a lifelong love for baseball. As a young man, he played for a team in the Great Soo League. McCarthy reflected on Watkins during a 1983 speech in Minneapolis. "There were sort of three cultural threads that ran through the town. One was baseball. We worried a great deal about baseball. You started worrying about whether you'd make the team when you were about 11, and stayed on through it," said McCarthy. "The church was quite central for a number of reasons, but in any case it was there, religion. But it wasn't as a religious force but rather as a cultural reality. "And the third was the railroad track. It sort of punctuated the day. There were two flyers at that time, one called the Mountaineer and the other the Winnipeg Flyer, which went through about 8:00 at night. And it was part of the great excitement of every day." McCarthy was a devout Roman Catholic and studied briefly to become a monk. He graduated in 1935 from St. John's University in Collegeville, where he majored in English. He later earned a master's degree in sociology from the University of Minnesota. "When I got out of college I taught school in Tintah, Minnesota, which is in the Red River Valley," said McCarthy. "And winters are long there. And you could begin to understand really why the glacier stayed there as long as it did, and sort of sensed it could come back the next day." McCarthy met his future wife, Abigail, while teaching school in North Dakota. He served as a technical assistant for military intelligence during World War II and then taught at the College of St. Thomas. McCarthy lived in St. Paul in 1948, when he was elected to the U.S House of Representatives. Four years later, he gained national attention by locking horns with U.S. Sen. Joseph McCarthy of Wisconsin. "Traitors are not gentleman, my good friends. They don't understand being treated like gentlemen," said Joseph McCarthy at the time. Joseph McCarthy was accusing many prominent Americans of being Communist sympathizers. The two men shared the same last name, but were not related. Albert Eisele said Eugene McCarthy was a witty, intelligent and well-read politician. He was also one of the few members of Congress at the time who would challenge Joseph McCarthy and the practice of red-baiting. "Politically, it was a dangerous thing to do. Because Joe McCarthy was at the height of his powers as the red-hunting witch-hunter, and was destroying careers left and right in the State Department and so forth," said Eisele. "And McCarthy was a junior member of the House, I think this was 1952, and debated him on one of the TV talk shows. And this was considered quite a risky thing to do and he came off very well. I think he gained a lot of stature." 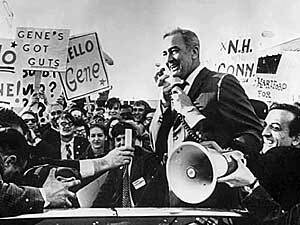 Eugene McCarthy gained further stature after his election to the U.S. Senate in 1958. McCarthy gave a speech at the 1960 Democratic National Convention nominating Adlai Stevenson for president. During the Kennedy and Johnson administrations, he became a leader of the so-called liberal block of Democratic senators. In 1964, Johnson considered making McCarthy his running mate but eventually picked another Minnesota senator, Hubert Humphrey. McCarthy was in many ways a political insider. But he also marched to his own drummer, and often bucked the party line. For those who hadn't yet heard of McCarthy, that independent streak became evident in 1968. "We're looking for 5,000 brave independents that can bring this country to its senses. Vote McCarthy March 12th, or you may have no one to vote for in November. Many political observers gave McCarthy little chance for success in the New Hampshire primary. But his criticism of the Vietnam War and President Johnson attracted enthusiastic audiences. College students from throughout the country flocked to the state to work on the campaign. They cut their hair and shaved their beards, inspiring the slogan "Get Clean for Gene." McCarthy appealed directly to the independent nature of New Hampshire voters. "Some of your Democratic leaders have said that you are all so well-organized and disciplined now that there's really no point in my coming in, that the people of New Hampshire will vote pretty much the way their leaders tell them to vote," McCarthy said in a campaign stop. "I doubt whether this is true. In any case, this is one of the matters I hope to test along the primary trail." McCarthy shocked the nation by winning 42 percent of the vote in New Hampshire, coming in a close second to President Johnson. The anti-war message had gotten through. The president was vulnerable -- a point not lost on New York Sen. Robert Kennedy, who would enter the race four days after the New Hampshire primary. Like McCarthy, Kennedy also opposed the war. Then on March 31, Johnson went on national television. "I shall not seek, and I will not accept the nomination of my party for another term as your president," Johnson said to a surprised nation. The political world had turned upside down. Former Democratic U.S. Sen. George McGovern of South Dakota says McCarthy was largely responsible for the upheaval of 1968. "Somebody had to stand up against the war policy and do it as a candidate. And that's what finally persuaded President Johnson we couldn't continue with the war," said McGovern. "I think the candidacy of Gene McCarthy, and then followed by Robert Kennedy in that same year, explained why President Johnson decided to not run for re-election in '68." McCarthy's campaign not only changed political strategies, it energized young people all over the country. Louise Klas of St. Paul was a long-time friend and political supporter. She saw first-hand how McCarthy affected local politics. "When you went to a precinct caucus in those days, I don't know, six or seven people might turn up. It was all fairly controlled and set, and nobody seemed terribly uncomfortable with that fact. But then when '68 came and Gene ran, there was barely enough room to get into the people's houses, barely enough room. The schools, the houses, the churches were bursting with people who had had enough of the Vietnam War," Klas recalled. "There were many who said our system could not be made responsible to this kind of challenge, that this democracy did not have the strength among its people to stand in mid-course against a policy, which was in progress, and to say this policy is wrong and something must be done about it," McCarthy said on the campaign trail. "Well, we did put the people to that test, and I think it's clear they have met the test." As the 1968 campaign progressed, McCarthy was no longer the only candidate speaking out against Vietnam. Robert Kennedy's candidacy split the anti-war vote among Democrats. The race grew more complicated in late April, with the entry of Vice President Hubert Humphrey. "Facing and knowing the hard realities of the office, yet also knowing the potential for good which lies within it, I shall seek the nomination of the Democratic Party," Humphrey announced. Humphrey bypassed the primaries, letting McCarthy and Kennedy slug it out in those states. McCarthy and Kennedy fought hard to attract young voters. They also made strong appeals to African Americans, demonstrated by this campaign ad for McCarthy. "This is Louis Lomax. Last Saturday night, on a nationally televised debate, Senator Kennedy of New York and a presidential aspirant, suggested that Negroes should remain in the ghetto until they have been properly educated and job-oriented. Senator Eugene McCarthy of Minnesota, also a aspirant for the presidency, said that we should break up the ghetto now, that this would be apartheid if we didn't. Kennedy says we should remain there another 20 to 30 years. I don't plan to stay there that long. That's why I'm going to vote for Eugene McCarthy." On April 4, 1968, Kennedy reached out to black voters in Indianapolis. His campaign appearance was just a few hours after the assassination of the Rev. Martin Luther King, Jr.
"What we need in the United States is not division. What we need in the United States is not hatred," said Kennedy in a memorable appearance. "What we need in the United States is not violence and lawlessness, but is love and wisdom and compassion toward one another, and a feeling of justice toward those who still suffer within our country, whether they be white or whether they be black." Kennedy's following was growing. In June, he scored a decisive win over McCarthy in the California primary. But the campaign then took a tragic turn. RFK was assassinated shortly after his victory speech in Los Angeles. McCarthy marched ahead with the campaign, his attention now turning entirely to Humphrey. "Humphrey was a stand-in for Johnson. And in effect I said, the issues of the war and and the issue of the Johnson conduct of it, Johnson in effect laid the burden of the war on the party and on Hubert," McCarthy recalled years later. McCarthy watched as Humphrey solidified support among traditional Democrats. In the non-primary states Humphrey accumulated delegates, which at that time were largely controlled by state party organizations. He was the favorite heading in the Democratic National Convention in Chicago. Support for McCarthy was fading. McCarthy was interviewed on Face the Nation on CBS television from the convention, and was asked whether he would be willing to work out a compromise with Humphrey. McCarthy responded that wasn't possible, since Humprehy was being vague on his position on the Vietnam War. "He knows (my position). I don't know his position on Vietnam. I don't know his position, really, on the bombing right now," said McCarthy. "I don't his position on the withdrawal of troops in the way it's proposed in this platform, whether he'd go that far." McCarthy's supporters were joined in Chicago by thousands of anti-war protesters. The streets exploded in violence. Mayor Richard Daley ordered the police to deal harshly with the demonstrators. McCarthy never showed up at the convention hall. The choice was already made. The party establishment anointed Humphrey as the nominee on the first ballot. McCarthy later addressed his supporters at the Hilton Hotel. "I may be visibly moved. I've been very careful not to be visibly moved throughout this campaign. You people keep on this way and I may, as they say, lose my cool," he said. "I said early in this campaign that I hoped if I won that instead of riots, we might have dancing in the streets. I'm hopeful that despite what did happen, we may have some dancing and some singing in this country before 1969 is over." McCarthy eventually backed Humphrey, but the endorsement came late in the campaign. Humphrey lost a close election in Nov. 1968 to Republican Richard Nixon. Democrat George Wallace was also on the ballot as an independent. Some blamed McCarthy for Humphrey's defeat. Former federal judge Miles Lord of Minnesota was friends with McCarthy and Humphrey, but he supported Humphrey for president. Lord said too many McCarthy supporters stayed home on Election Day. "McCarthy did what he wanted to do. I was really sorry he was so stubborn, because we could have had Humphrey instead of Nixon," Lord said. McCarthy remained in the U.S. Senate until 1970. He tried for the Democratic nomination for president again in 1972, but lost to George McGovern. McCarthy made another unsuccessful bid for president in 1976, running as an independent. He attempted to reclaim his U.S. Senate seat in 1982. Two more futile presidential campaigns followed in 1988 and 1992. Still, it's the 1968 campaign that people remember him for most, even decades later. Friend Louise Klas said the impact of that year was evident every time McCarthy made a public appearance. "I've watched many an individual come up to Gene, and their eyes just full of tears, saying things like 'It's because of you that I am in the Legislature. It's because of you that I became active in politics,'" said Klas. After politics, McCarthy spent many years teaching and lecturing. He was a prolific writer and poet, authoring 30 books. In 1997, he appeared on Minnesota Public Radio and read from his latest collection of poetry. One poem was titled "The Maple Tree." "The maple tree that night, because its time had come, without a wind or rain, let fall its leaves. They fell, brown veined and spotted, like old hands fluttering in a blessing, upon my head and shoulders, and then down in silence to my feet. I stood and stood until the tree was bare and have told no one but you that I was there." McCarthy and his wife, Abigail, separated after the 1968 election. She died in 2001. McCarthy is survived by daughters Ellen and Margaret, son Michael, and six grandchildren.